For the American West enthusiast, a natural buffalo skull will lend character and the spirit of the west to your den or study. Hang it above the fireplace or make it the focal point of any wall. Cleaned to museum quality. This American Bison skull is approximately two to three years old and, in keeping with the Native American tradition, all parts of the animal are used. 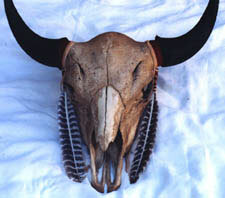 For those who prefer a more natural look: the bison skull show below has been antiqued and finished. Feathers adorn each horn. Natural American Bison Skull is $225. Antique American Bison Skull is $275. Due to its size, this item is not available for gift wrap. However, we can enclose a gift card. To read our profile on artist, Linda Hensley, click on Meet the Artists. Approximately two feet wide by two feet long. Ready for wall hanging. Horns are removed for shipping purposes and can be easily reattached.